The Nigerian Army Women Corps (NAWC) concept was to harness the potentials of female officers and soldiers to build a force ready to support army operations and engagements. He noted that events in the country had shown the imperatives of constantly improving security apparatus which was one of the major policy thrust of the current administration. This, he said underscored the need to get all hands on deck, irrespective of gender to strengthen the security of the country. “This calls for adequate training facilities and strategies to improve the fighting efficiency of all military units. The dynamics of army operations in this dispensation are such that the female personnel cannot be left behind. “They are vital to the attainment of the army’s operational objectives especially in the North East where women and girls, involved in insurgencies as either victims or villains, require specific female attention. “There is no gain saying the fact that there are some military operations such as psychological operations, in which the female officers and soldiers by their gender excel over men,” he said. According to Buratai, the army is set to take advantage of this unique nature of the female personnel. He, however, said that in order to effectively fulfil that requirement, the female personnel need to be brought up to speed through deliberate training to build their fighting capacity and competence. He said the female corps was faced with daunting challenges which include effective training of its personnel. 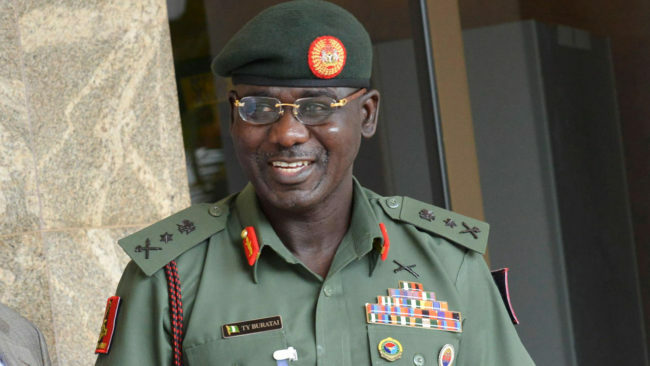 Buratai said the theme of the three-day training, “Building the Fighting Capacity of Nigerian Army Female Personnel for Enhanced Support of Operational Engagements”, was timely. “This is especially so because the NAWC is still in its infancy and has the liberty of evolving its own unique training programme that will take it to the desired heights. He noted that their position in the army, in the face of ongoing operations against insurgencies and other engagements of the army in the country was strategic. The army chief calIed for attitudinal change towards the female personnel in order to build their confidence and motivate them to put in their best. He added that there must be complete re-orientation on how female soldiers are perceived within the military. “They should not be seen as being merely decorative or passive. They should rather be viewed as viable tools for achieving operational goals just like their male counterparts. “I urge you all to see the female personnel for who they are; normal, capable and competent soldiers. Let us all remember that Joan of Arc and Queen Amina of Zaria were sound warriors despite their gender. “Though one was of European origin and the other Nigerian, the fact that they both excelled as soldiers and commanders in the defence of their nations underscores the universal nature of the phenomenon. “We should never lose sight of this historical fact but rather build on it and avail ourselves of the invaluable qualities of our female colleagues,” Buratai said.